Camembert is the most famous of the white mould cheese family and was first produced during the French revolution, a real newcomer in the world of French cheeses. During the worst of the terrors of the French Revolution a kindly farmer's wife from the village of Camembert in Normandy hid a persecuted priest who fled from the area of Brie which was already famous for it's soft white cheeses ( fromages a croute fleurie ). In gratitude the priest shared with the kindly woman all of his skills in the art of cheese making. 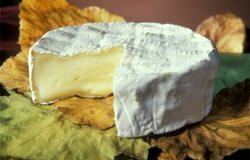 As is often the case this new delicious soft cheese took on the name of the place of its origin and Camembert was born. This style of cheese is now made all over the world but the true Apellation d'Origine Controlle Camembert is only produced in the French departments of Calvados, Eure, Manche, Orne and Seine-Maritime. A culture is added to the surface of the cheese to help in the formation of the typical downy crust and the cheese is salted and places in a cheese cellar on racks to mature. Each round is turned every 2 days and takes about 30 - 35 days to mature. A properly matured round will have a soft downy white crust speckled with brick red patches, a soft, bright yellow semi-liquid interior and a rich odour. Once experienced, never forgotten and much more succulent and delicious than the chesses by the same name lurking in our supermarket shelves.